This painting was created for the painting classes, is a simple painting for a person that is starting to paint and wants to learn to paint a palm tree in the beach, colors, composition, and ocean. Start by drawing the palm tree, and seascape. Continue by doing an acrylic under-paint, using a watered down paint to apply translucent washes on your surface. Paint the sky, ocean, mountains and beach. Finally paint the palm tree on the top. Acrylics: There are many brands of acrylic paintings that I have tested but the one that I like the most is SOHO, Urban Artistic Acrylic: Excellent paintings, sold at more reasonable price by Jerry’s Arterama. 3060 Wake Forest Road, Raleigh, NC 27609. (919) 876-6610. Clina’s paintings are exhibited and for sale at Southern Suds, The Renaissance Centre for The Arts in Wake Forest and The Franklin County Art Council, NC. ≈ Comments Off on Sea Dunes, Painting Supply. Seascape for the painting classes. Lazy summer days seating in the warm sand looking at a sale boat going by. 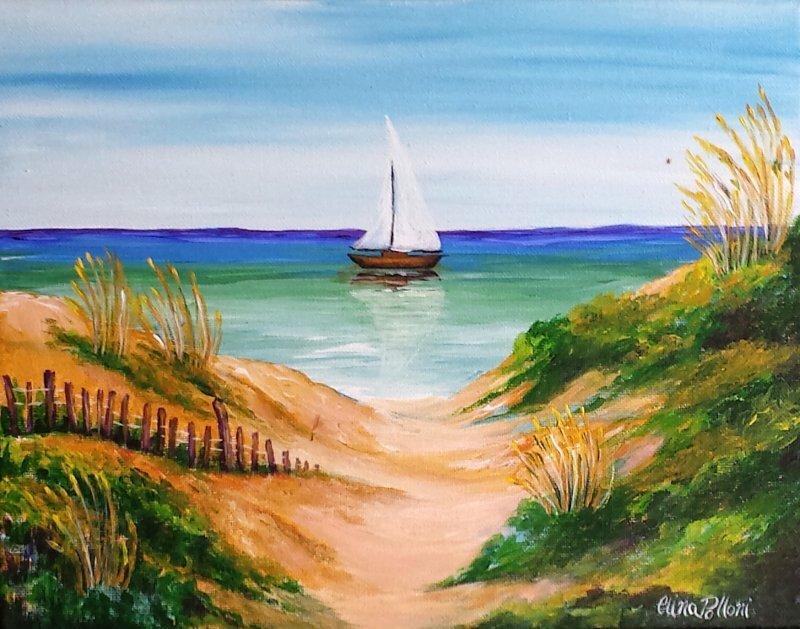 This painting was created for the painting classes, is a simple and charming painting for a person that is starting to paint and wants to learn about the beach, reflections of a boat sailing and sand dunes. SOHO, Urban Artistic Acrylic: Excellent paintings, sold at more reasonable price by Jerry’s Arterama. 3060 Wake Forest Road, Raleigh, NC 27609. (919) 876-6610. You can also buy the supply on line. Brushes, multi-purpose, polyvalent. There is a 10pc “Artist’s Loft” at Michael’s, they provides most of the brushes for the beginning or the Pro Stroke-Power Creative Mark of Jerry’s Arterama. For Oil paintings, the best media is Refined Linseed Oil with Refined Turpentine. To clean the brushes Turpernoi. Glass container to mix media, I have some containers in the studio. Pigeon Point Lighthouse Painting, Supply and Instructions. ≈ Comments Off on Pigeon Point Lighthouse Painting, Supply and Instructions. New lighthouse for the painting classes. This painting was created for the painting classes, is a simple painting for a person that is starting to paint and wants to learn to paint a lighthouse, colors composition, clouds and ocean. Start by drawing the lighthouse. Paint the sky, clouds, ocean and the grays of the lighthouse. Shade and light. Enjoy finishing your painting with colors. House in the Island Painting Supply. ≈ Comments Off on House in the Island Painting Supply. New seascape for the painting classes. 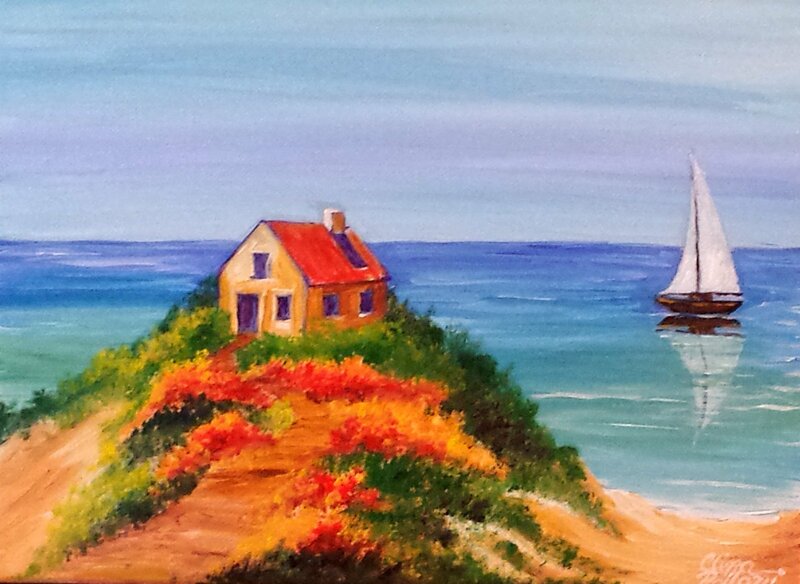 This painting was created for the painting classes, is a simple and charming painting for a person that is starting to paint and wants to learn about the ocean, reflections of a boat sailing and most important the little house in the cliff of the sand dunes. Next Group Painting Class-Sunday August 9, 2015. Summer is here!!!!! With wonderful colors, learn to paint the blue ocean, sand and a sale boat. Come and paint with us on Sunday August 9, from 1:00 to 3:00. Please let me know if you are interested in this class or if you would like to schedule another date and time. Please reply to Clina Polloni at clinapolloni@gmail.com or call 919-841-3132. Summer is here!!!!! With wonderful colors, paint the sunrise and sunsets in the ocean. Come and paint with us on Saturday July 18, from 1:00 to 3:00. Please let me know if you are interested in this class or if you would like to schedule another date and time. Location: 7057 Jeffreys Creek Ln., Raleigh NC 27616. Click here for map and directions. Please reply to Clina Polloni at 919-841-3132 or clinapolloni@gmail.com. Summer is almost here!!!!! Let’s paint some seascapes together. Come to paint with us on Saturday June 13, from 1:00 to 3:00. Please let me know if you are interested in this class or if you would like to schedule another date and time. Saturday November 1, 2014. You can request a group painting class at any time on any day of the week. $30 for 2 hours, per student, $25 if students brings their supply. Private painting classes by appointment: $30 for 1 person, for 2 hours. $25 per person, for 2 persons or more. Need to bring you own supply, I will send you a list of supply needed for the painting that you select. Click here to view a selection of paintings. Call Clina Polloni at 919. 841.3132 Email: clinapolloni@gmail.com Location: 7057 Jeffreys Creek Ln., Raleigh NC 27616. 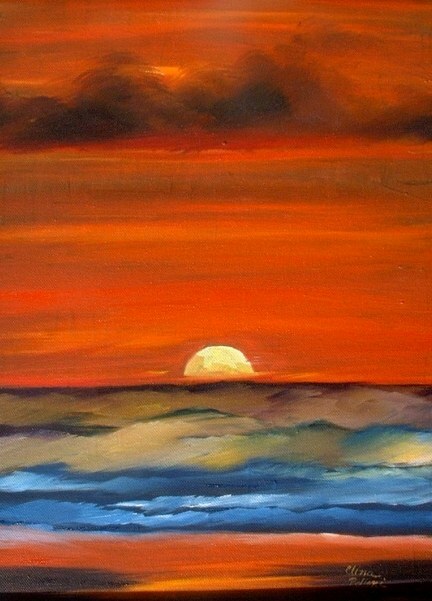 Wild Sunset, painting by Clina Polloni for our painting classes. This is a sunset at Emerald Island, North Carolina. Rays of fire, harmony of yellows, oranges and blues, a wild transition from day to night inspired the colors for this painting. Emerald Isle is in North Carolina, a part of the Crystal Coast and is located entirely on the Bogue Banks. Looking from the air is a solid green gem in the middle of a sea of sparkling water, that is why the island was called Emerald Isle. From about 500 AD to colonial times. Emerald Isle was home to Native Americans. Later, the area was settled by a small number of whalers and fishermen. In the 1920s Henry Fort, who owned the Emerald Isle beaches and land surrounding them, hoped to open a large summer tourist attraction and ocean resort. Fort worked with developers, but the plans never materialized. After his death, his daughter Anita Maulick inherited the island.